Now this is a unusual article to write for me: It is on a building that I know literally in and out - the rather ugly, yet listed and architecturally valuable headquarter of the Austrian National Broadcast ORF. I know it so well because I have worked there for a year as a journalist and editor, doing reports for news programs. Presenting it for my travel guide website is rather funny, though. The building is situated on a hill called Küniglberg and surrounded by residential houses, a playground with a little park and the cemetery of Lainz. It is six floors high, and ranks as well as corruption rise the higher you get: The management sits on the sixth floor. In ORF-internal jargon, "a sixth floor request" is an idiom for an order directly from the management. Being a simple science-editor myself, I have made it only to the second floor. As it is the case with all public or semi-public companies and organisations in Austria, the ORF is under tight control by the political parties and thus, very vulnerable to political manipulation. This is particularly sensitive in Austria, since the ORF had a national TV monopoly until 1998 (of all European countries, only Albania was even worse than Austria). As the World knows since 1938, Austria isn′t too critical about politics or hierarchies and so "the Küniglberg" is widely accepted as a source for eternal truths especially among the older generation. Fifty percent of the ORF′s budget is covered by compulsory fees that everybody in Austria has to pay if he or she owns a TV set or radio. Just like the BBC - only that the ORF′s program is 90 percent rubbish. That much for my ranting about my former employer and it′s wonderful products. Anyway, approaching the ORF building, you will note the eye-like logo at the entrance. It was designed by an Austrian artist in recognition of behavioural biology. Note that ethology (the comparative study of behaviours) was widely developed in Austria and an important discipline until well after WWII. The building was designed by Clemens Holzmeister and built between 1969 and 1976. It looks very unappealing from the outside - at least to me - but from the inside, it is actually quite decent. The only disadvantage is that in 2007 (when I worked there), every bloody editor seemed to be a chain smoker and the entire building, all offices, corridors, even cutting rooms, some sound studios and toilets were full of bloody cigarette smoke. Which had its good sides, too: On my first day, I got an office at my own that had been used by an editor who had died from a heart attack the week before I arrived. The building is 80,000 square metres big and over 2,000 people worked there when I was employed by the ORF; since then, the "sixth floor" tries to cut down employees since they loose market shares at a dramatic rate since the end of the monopoly. 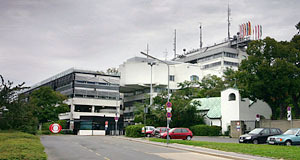 In the ORF Zentrum, two TV channels are being produced, although studio facilities are often external - or entire programs are bought from private production companies. The "peak" of Mount Küniglberg is 261 metres high. It actually has quite a bit of history to tell: The area has been populated since Neolithic times, as findings from the nearby Rosenhügel hill tell. The name Küniglberg is either derived from a clergyman from the 16th century or from an Imperial administrator who lived here in the 18th century. For sure it was called "Am Königlberg" in a document dating back to 1786. During WWI, the Küniglberg was used as a FLAK station for the defence against air raids (for more on this, read my article on the Flak towers of Vienna). For more ORF sightseeing, I recommend you to do a guided tour - that way, you can see some of the studios and production facilities. More interesting than the TV section on the Küniglberg is the radio headquarter in the Funkhaus in the fourth district of Wieden.